Sample is 3/4-by-2-1/4-inch square-edge solid strip. Color: Heartwood varies from yellow-brown to dark golden brown; turns rich brown under exposure to sunlight. 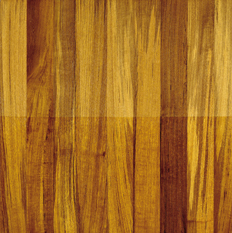 Sapwood is a lighter cream color. Grain: Straight; coarse, uneven texture. Variations Within Species And Grades: Moderate to high color variation. Hardness/Janka: 1000; 22% softer than Northern red oak. Dimensional Stability: Excellent (change coefficient .00186; 50% more stable than red oak). Durability: Strength values are similar to those of American oak. Sawing/Machining: Moderate ease in working with hand and machine tools; silica in wood dulls tools quickly; carbine tooling is recommended. Sanding: Clogs abrasives; frequent sandpaper changes are required. Finishing: Natural oils may interfere with adhesion and drying of some finishes. To reduce the wood's tendency to repel finish coats, surface resins may be removed with a solvent that is compatible with the finish to be used. Comments: Has an oil feel. Unique in that it does not cause rust or corrosion when in contact with metal. Respiratory and dermatological allergic potential. Nobody Beats Our Wood Flooring Prices. Nobody!